Mass Effect was truly an epic game, one full of planet-hopping, galaxy saving, and alien shagging. Since the original seemingly had it all, constructing a worthy follow-up would be quite a daunting task. Thankfully, Bioware seems to be up to the challenge, keeping everything that was great about the first game and improving upon all its little problems immensely. The first change worth mentioning is that Mass Effect‘s much maligned combat has been greatly improved. My demo had me raiding a tower on a blue metropolitan planet that looked a bit like Coruscant from Star Wars. Classes have been tweaked from what they were in the first game, opening up new abilities to fit every player type. In this case, I was playing as a Soldier build and the assault rifle was my go-to weapon. 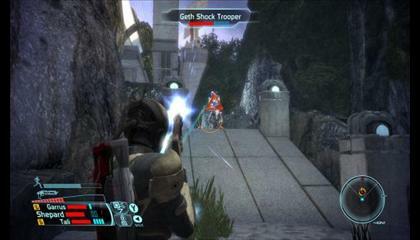 The combat is similar to the original, with the time-stopping weapon and ability wheels popping up with the press of a button. Everything is a bit faster paced this time around, with two hot-keys available for different rechargeable abilities. I could also tell individual teammates to lock-on to different enemies at any point. Where an enemy gets shot now seems to make a much bigger difference in how they react, making combat that much more visceral. All of this comes together very smoothly, as I could imbue my bullets temporarily with a special power that would send enemies floating through the air and then tell my squadmate to take them out while they were incapacitated. The first Mass Effect did a lot to push dialogue trees forward in games, but the conversations were not without their problems. While the voice acting was great and the facial animations were expressive, dialogue sequences still felt stilted and janky as the camera unceremoniously cut between two staid characters. Now, the camera and characters both move around a lot more, proving that the inhabitants of the Mass Effect universe can *gasp* both walk and talk at the same time. Bioware has also made these interactions time-sensitive, so you can’t just stand there awkwardly deciding how to respond. The game forces you to be quick, or the conversation may not go the way you want it to. Furthermore, you’ll have the option to interrupt a chat with the left shoulder button. In one choice example, we were shown Commander Shepard ending a discussion by throwing a guy out of a window, hearkening back to the days when Han Solo could shoot Greedo first and yet still be the hero. Some of the more interesting new features of Mass Effect 2 are things that we haven’t yet seen, like the game’s significantly modified story structure. 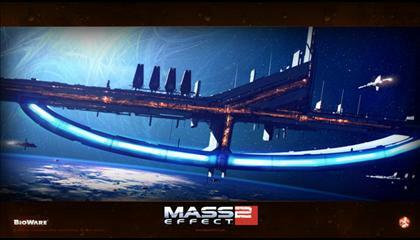 We are told that Commander Shepard must go on what’s deemed to be a "suicide mission" and has to gather specialists from around the galaxy to assist him. This mission is available from fairly early on in the game, though you won’t stand a chance if you go straight to it. Instead, you’ll have to go on a series of quests to recruit comrades for said battle. Who you recruit and how you treat your crew will all effect how they will behave during the final encounter, as treating them poorly might make them leave you high and dry. On the other hand, building up a sense of camaraderie among your team may make them risk their lives to save yours. This leads to far more endgame possibilities than the original, where the ending was dependent on a scant few binary choices late in the game. 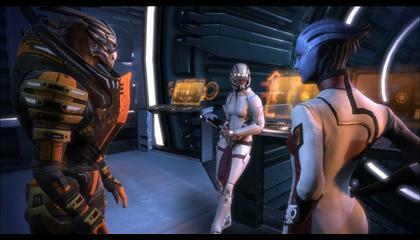 As such, no two playthroughs of Mass Effect 2 will be exactly alike. Your crew in ME2 will mostly be comprised of new characters, though you will be able to import your ME1 save data to bring back some familiar faces. It is unclear if these returning characters will be able to join your party. You’ll also be able to continue playing as your previously-crafted version of Commander Shepard from the outset, as the game doesn’t force you to rebuild your avatar. For those who haven’t played the first game, the story was built to be able to hold up on its own, and all of the vital backstory will be presented in-game to bring everyone up to speed without pandering to series veterans. While the most interesting new additions are all theoretical at this point, it looks like the fine folks at Bioware know exactly what they’re doing. They’ve taken just about every piece of criticism from the first game to heart and have done everything in their power to improve them. While it’s still a long way off, Mass Effect 2 looks to be one of the most finely crafted action-RPGs ever created. While a release date has not been announced, you should expect to get your alien groove on sometime in Spring of 2010 on Xbox 360 and PC.